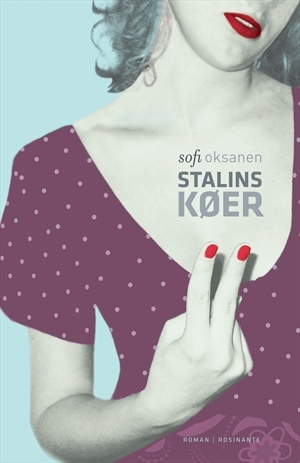 Sofi Oksanen, I wish I could read Finnish so I could read your debut novel in its originality. Not that the translation was bad at all. It’s just… I feel there is something embedded in the language itself, that cannot be translated and understood at all. Like I have read a story that has so much cultural baggage, that this novel alone cannot satisfy my knowledge on the cultural/political aspects of this novel. And language (or expression) is a very important part of ‘Stalin’s Cows’. Language is identity and culture, it is something that both manages to distinguish you from and unite you with others on different levels. And when there is so much stigma attached to your heritage you go on the fence. But the narrative is interspersed with snippets of utterances in Estonian, Russian and Finnish that arrest my journey. And so the whole idea of denying someone the use of language, the right to express through language a part of one’s identity, proves to be futile; it wants out, it gets out, it finds ways no matter how hard you try to cover it up. Sofi Oksanen, if I wanted to do my project justice I would sit myself down with an encyclopedia (old school), history books, essays on cultural transposition, and a dictionary, so I could tear the novel apart and let it percolate through my mind. It’s not just the words, but the enormous baggage and memory that lies behind them I want to get to. There is literature that wants to investigate itself on its own premisses, and then there is literature that needs words to give up their own agenda and become translucent – still autonomous, but hinting at another level, often in need of a personal voice, a subjective form to utilise language. And then, language is really just a conveyor belt. Sofi Oksanen, the way you decide to delve into the logic of an eating disorder fascinates me. Dealing with it all cool and distanced, on a theoretical level, a tour de force in self-delusion, you chose latent communication. What does ‘Stalin’s Cows’ want to say? Is self-preservation, the physical minimum-survival-excistence, above all other aspects of life? If you spend your whole time making escape routes, creating a persona or shell, denying your identity in the process, the most engaging part of the day will not be how to live in the world, but how to endure yet another day in your own body. The logic of the eating disorder spirals through and through in Anna’s obsessive expositions and the language of food consumption and paranoia shrouds every day, every encounter, every meeting and flashback. I read in an article recently that it took us several hundred thousand years to go from 0 to 1 billion people, and only 12 years from 6 to 7 billion which is expected to be the count for the world population in 2011. So many people, everywhere, and a number that is growing so rapidly, has gotten many people seriously questioning the prospects of sustainability and life quality. It is estimated that 1 billion people suffer chronic malnutrition and many more are just scraping by, affected by floods and other climate disasters that countries are unable, in one or several ways, to help their citizens survive. At the other end of the line, where the life and death scenario is not an immediate issue but where people are struggling to find meaning of their existence in this big world, you have the misplaced, the in-betweens, and the getting-by’s of Western so-called developed countries. Someone has said that we are losing touch with compassion, empathy and solidarity across the board the last decades, that our trip to individuality has left us so me-me-me fixated that we cannot see past the tip of our noses if it doesn’t apply to us in an immediate fashion. I got a call from Amnesty yesterday. It was a person on the other end who first thanked me for my contributions in the previous year and then told me that they could use more help if I was up for it. He then went on to talk about a specific place where my contribution (they never say money, maybe it is just to dirty a word, to acknowledge that our society has built itself around currency) could do good, namely Haiti, where women are raped in greater numbers than ever before due to the lack of control and corruption that leave the police at best indifferent (his words) to the women’s suffering. Finally he asked in a meek voice if I thought that I had some way of making room in my budget so I could possibly up my contribution a little bit, so they could do more humanitarian work. When I said yes to his suggestion he sounded so genuinely happy, that I felt really ashamed that I had not suggested a larger amount of money. And then surprised by this. Now why on earth was I not just happy to contribute? And why mention this in a book blog? 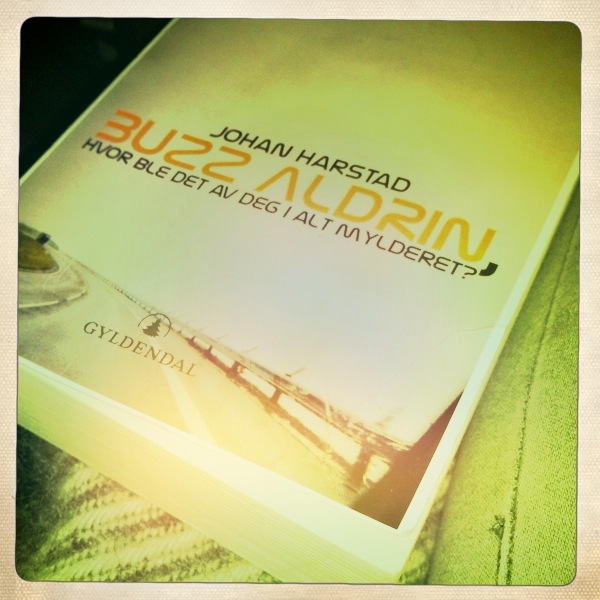 Well, I have had these kinds of thoughts with me while I read Harstad’s ‘Buzz Aldrin, hvor ble det av deg i alt mylderet?’ (English title: Buzz Aldrin, what happened to you in all the confusion?). Maybe it’s a bit weird to introduce Harstad’s novel with these two very concrete examples, since it is not a book that deals with natural disasters, famine or (over)population. But it deals with the one in the masses of humanity, and what effect they have on others, what sort of chain reactions lead on lifeline over to another. For me Harstad’s character, Mattias, is a central contemporary voice of those in-between’s. He is also the One in the book – the individual, the center of causality. But even so, it is not an egomaniac who fills the pages. You feel like slapping him for his apathetic and apologetic nature, and yet you sympathize and identify with him. The novel centers around a person who is dislodged and alienated from himself, his family, his girlfriend and society so much, and just wants to fizzle out in the great vast ocean of people, to not attract attention or make a fuzz, that he ‘flees’ from Norway to the Faroe Islands. A place where no one knows him and he knows no one. In this postmodern, fast-paced lifestyle he is one person who does not feel or doesn’t want to feel the drive of a winner, a top-competitor, someone who strives to be the best, at one point it states that he wanted to be the best second-best or runner up. He just wants to get by, to fill some service void, and get on with it. At the same time he is caught between two places, because he is aware of the fact that he doesn’t want to disappoint those who are close to him – he is scared to oblivion of being useless, of being in the way. He creates a buffer around his person and all around him. But on the Faroes he discovers a group of people (or rather they discover him) who take him in – at a psychiatric half-way house – and he connects with them. They are in a way embodiments of his own fears, and at the same time mirrors of his situation. Together they form a society of in-betweens. It’s not very often someone from outside the Faroe Islands sits down with a pen and starts writing a novel using the islands as a backdrop. And in a way it feels very strange reading this without giving way too much attention to the scenery when you know Klaksvík, stood freezing in a bus shelter on Hvítanesvegur and drove too many times around the islands in a car because there is little else to do when you are uninspired. 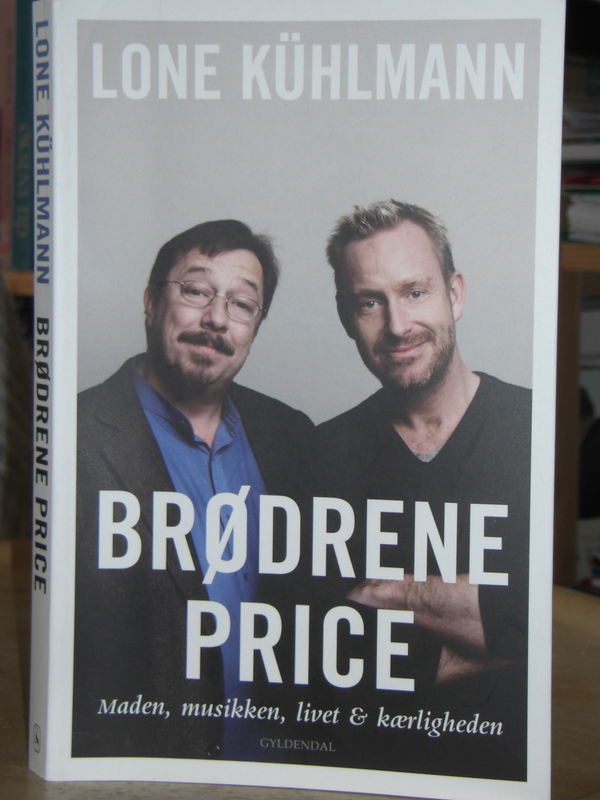 And if I am not much mistaken, the photo on the cover is of the road to Gomlurætt – a symbol of a halfway place between modern city and quiet home town. Always covered in fog – timeless. Very symbolic! But then again, it is not a story of the Faroes but of Mattias and all the people. The style of narration is exquisite, so vulnerable and rambling at points and concise at others. Some parts of the book have sentences that go on for 2-3 pages without a punctuation, and you find yourself running along with this fast pace, this ‘have-to-get-it-out-no-matter-how-it-sounds’ pace. He describes with fervor the in-the-moment scenery that you make faces and places come alive in your head while you read instantaneously. I think it is also this in-the-moment moments that Mattias lives by and can cope with. The world is so big, there are so many people, all the people everywhere, that he chooses to focus on one person or one feeling at a time. And the important thing is not what I sang, but that I did it, and the sound filled the room, it forced its way around the church multiple times and through our heads before it pushed its way through drafty walls and clock towers, half-open doors and the people who stood outside felt warm for a minute, they closed their umbrellas in sync and stood there silently as the sound lifted itself over their heads and laid down on Saksun like a fog no one had ever seen before and I heard people crying, I heard people who could no longer hold back, and the minister went to his quarters for a minute, Havstein took a hold of Carl and Carl was sitting with his eyes fixed to the ground and did not dare look at the mother and Anna held her arms around Palli and Palli looked straight ahead and Havstein smiled to me, Sofia’s mother closed her eyes and I sang more powerfully than ever before, I tried to lift the roof, I tried to force the beams holding the roof to loosen from their battened places and open the building up, I wanted for the model boat that hung from the ceiling to sail out and the organist was doing his best to keep up, kept the pace with the notes and crawled up the register as I moved further and further in the song and at one point I left the lyrics entirely the way it was supposed to be sung, but the organist followed, we left the music and the lyrics and it just became sound and the sound enfolded everyone of us in warm woolen plaids and got us aboard unsinkable boats and I carried us over the oceans and onto land in another place and held the last notes for as long as I was equal to, and afterwards it was so quiet that you could have heard a bacteria falling from the ceiling and landing on the floor. Not even God himself could have walked soundless through that room. You had just finished Adichie’s latest book and sat down to write a post to your blog about it. You had realized that it was drawing your mind towards yourself and the people and places around you. It was the summer you did not go to Roskilde Festival, the summer you finished early at uni and started late, the summer your mother was waiting anxiously for your arrival back home, where you belong, on the little islands in the vastness of the Atlantic Ocean. The islands very few people knew, and most outsiders deemed either breathtakingly beautiful when speaking of the nature, or backwards and stubborn when speaking of its inhabitants, of course they did not know the incredibly fabulousness of the society because they weren’t insiders. You were watching the sunny pavement outside and wondering what kind of weather would form your holiday visit to your homeland. Adichie speaks to me. The little section here up above is my own humble way of showing one of the narrational techniques she uses and the air with which she does it. She is a storyteller of refreshing confidence. The stories are pervaded with curious impressions of her women protagonists, who either are out of their cultural boundaries, relocated in geography or seeing new situations arise out of old settings. So many of these short stories deserve attention on so many levels but what most struck me (probably on a relational level) was the sense of being or existence on the one hand, and the quizzical reflection the narrators have on people who deny their culture and identity. There is a lot of emphasis on who someone is, and why someone is. What does culture mean, and how ingrown are you? Is it easy to change from one cultural identity or are you just posing, trying to fit in? When you no longer feel kinship with a former identity, do you feel shame, or do you scorn others for not evolving as much as you? Do you have the right to weave your own culture into someone else’s, to put your mark on it? All of these questions arose in my mind while reading Adichie, and all of the women are so beautifully human. However, I also have some reservations with the stories. In general, the issue of race, and especially the multifaceted power issues between white and black, somehow always ends up in the same critique of the former and the self-negating puppet actions of the latter. The former is always displaying condescending attitude towards the latter, no matter if he means well or is trying to forcibly impose his ideas, and the latter takes the rottenness of the former and pervades himself with it. Granted, the issue is fraught with so much background by now, that no matter what stance you take, you take the wrong one. But it gets tiring, and I do wish (fairytales and pixie-dust) that we could move on, individual to individual, on more equal terms. ‘The Thing Around Your Neck’ did for me just what I want books to do for me: they opened a door into a realm I am not entirely aquatinted with and invited me to think (even if some doors were closed and some places were thought for me). I have talked so much about my mailbox these last entries that I think I should name one category ‘mailbox’. Today was no exception: I opened my mailbox and two books came tumbling out, much to my delight. The Blixen book I received for the tweet I talked about in my earlier post. It is so pwetty! I think I will wait a while before reading it, and just enjoy its crisp, white cover for a while before I smudge it with my ever so clumsy butterfingers. The second one I received so I could review it. And this one I will definitely start on today. I have bought Adichie’s earlier book ‘Half of a yellow sun’ – which coincidentally is also on my ever-growing to-read-in-summer list – so I contemplated if I should read that one first, but really, I don’t really see the point in keeping up with chronology. 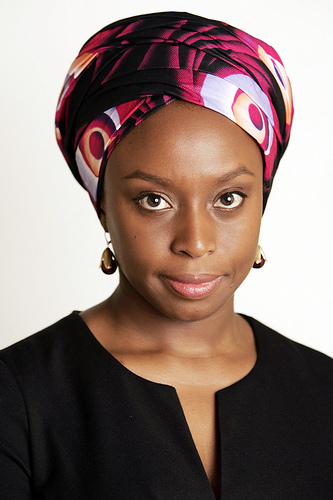 Chimamanda Ngozi Adichie is Nigerian, educated in the USA and has written two novels before this one. ‘Half of a yellow sun’ is set in 1960’s Nigeria in civil war-time and it centers on three main characters. 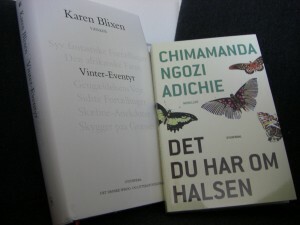 ‘The thing around your neck’ (the book on the photo) is a collection of short stories, originally published in 2009 and translated/published to Danish in June, 2010. I have never read (that I remember, or know of) any African writers’ works, so I am looking forward to see how she writes, and what she writes about. It seems that Africa is for the most part narrated in the Western culture through monetary/monitory voices, so it will be nice to hear from the people who actually grow up and live in Africa. With the craze of the World Cup in South Africa, where the vuvuzela has been no. 1 item on news channels’ report list, it has managed to overshadow every other good story they could run about this fascinating country. So I will turn off my TV (my mother and brother are going: “Blasphemy! !”), make a good cup of tea and sit in my chair reading my way through Africa, until the day I walk the continent and see it for myself.